According to a report published earlier today, Apple is, unsurprisingly, very much ahead of other smartphone manufacturers when it comes to brand loyalty. The news comes from Reuters – a reputed international news agency – in the form of a report in which they cite a study (and, of course, its results) by GfK – a research firm – which claims that Apple is “well ahead of rivals in building brand loyalty” among consumers of mobile products. According to the study, Apple maintains the strongest brand loyalty with its iPhone smartphone as 84% of people who currently use an iPhone said that they would get an iPhone again. This is compared to 60% of Android smartphone users and 48% of RIM’s Blackberry owners. Around 4,500 people from the United Kingdom, France, Germany, China, Japan, Brazil, Spain, Italy and, of course, the United States were interviewed for the study. Some 84 percent of iPhone users said they would pick iPhone also when they replace their cellphone, while 60 percent of consumers who use smartphones running Google’s Android said they would stick with phones using the same software. Only 48 percent of people using Research In Motion’s cellphones said they would stay loyal to their Blackberrys, the study showed. One of the analysts at GfK stated, on the average, about 63% of customers stick to one brand of smartphone. Hence, it is very important for smartphone manufacturers to capture as much market share as they can right now. 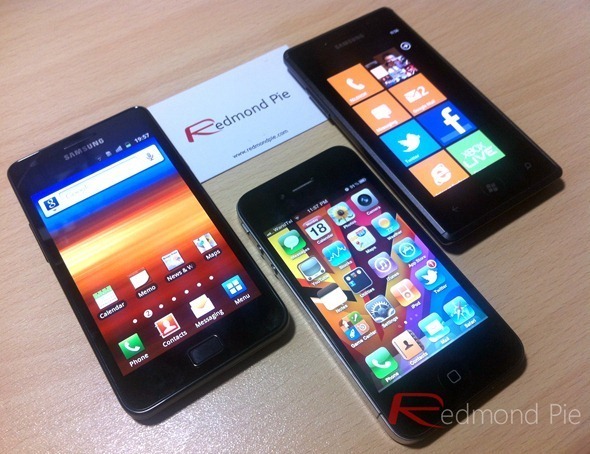 Still, despite Apple’s current dominance, the company’s brand loyalty may not stay like this forever as 2012 is expected to be the year when Android will gain even more speed while Windows Phone will emerge as a strong alternative for iPhone. Emphasis on expected. Smartphone sales have exponentially increased over the past few years. This rise started with the introduction of the iPhone in 2007 which revolutionized the smartphone industry thanks to its engaging user-experience which offered powerful features in an easy to use way. I myself own an Android smartphone (more specifically, the Galaxy S II), but will get an iPhone next because of Android’s, I think, as of yet “unfinished” feel. Yes, I love the OS’ openness and the powerful-than-iOS apps, but it has plenty of small things that add up to a disjointed experience. So yes, I am part of the 40% Android users who intend to jump ship soon. What about you?